A temperature-indicating controller with an advanced PID operation and an originally developed chamber configuration provide high chamber performance. Temperature uniformity, temperature constancy, temperature heat-up rate and temperature recovery time are performed with the upmost reliably. Triple safety mechanisms are employed for excessive overheating. 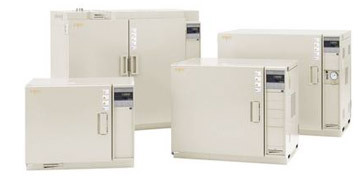 16 ovens are available with combination of temperature range, capacity, and instrumentation.